First newsletter, gathering the Pop Army! The latest news from the Bryan Rice camp. 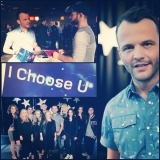 'I Choose U' is song # 1 in the Danish preselection for ESC 2014, so Bryan will be opening the show on March 8 in Odense, Denmark. As some may remember, the same happened in 2010 when Bryan opened DMGP10 with 'Breathing', standing in the rain. That must be good karma! 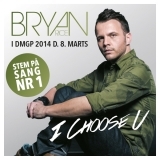 This picture is a poster we made so you can post it everywhere to show your support to Bryan in DMGP14. Please post it on Facebook, Twitter, Instagram, Weibo etc, remembering to tag #ichooseyou and #bryanricedmgp14 then we will look through all the tags and find a winner for a signed 'A Live Piece Of Me' CD after the contest. 'Dear supporter. This feels good! My first newsletter in many years... It is the beginning of a new chapter and as you might have seen, all sails are set! New press material, new single, TV performance, album in the making, new website, banners, logo, newsletter and a lot of other interesting projects on the side. I love it, I love being creative and being part of it all, and most of all, presenting it all to you. I can feel your enthusiasm and that's what makes my engine run. 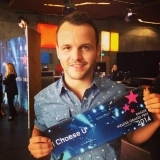 Right now everything is about 'Dansk Melodi Grand Prix 2014' (the Danish preselection for the Eurovision Song Contest held in Copenhagen on may 10) and how to win that. I'm really focused these days, training every part of my body and mind so that I can stand as prepared as possible on stage on march 8 in Odense among the 10 competitors. I am SO glad to announce that I will be opening the show with song #1 again. I did that with 'Breathing' in 2010 and it means a lot to me, a great start. We're planning the show and I promise you something great, rememberable, special and hopefully good sounding! All that is left is the support from all of you, not least Denmark, as the votes will come from danish cell phones that evening. This time I really need your help! Please, please, share the updates, be a part of it, share this picture on the left with 'Vote for song #1' so we can do it together! And remember, if you tag it you'll automatically be part of the competition to win a signed special ed. live CD. It's a busy popstar life right now, but I love it and I'm grateful. Things are going great with the 'Stay Awake' single, a feature I did on the French DJ Guéna LGs newest single. Read more about it below. And a lot of new interesting projects are on their way. That's what my life is all about, each day putting new little homemade paper boats in the lake and hope to see them grow into big supertankers... Some will drown but some of them also become great at sailing, and reaching you all out there in the world. Isn't that amazing! Every day I'm thinking of all the unbelievable help I get from people who believe in me and my music. I cannot thank you enough! Lars from www.thesign.dk doing all my logo stuff, artwork, banners, PDFs etc, you're amazing...And Dina from www.soheartme.com making my social media work and the new homepage so beautiful... Annette for making www.bryanricefans.dk and friends, musicians, family, supporters for helping me always. THANKS! 'Stay Awake' is doing great! As you may already know, I did a feature on a French DJ called Guéna LG. A really cool club track, in my opinion. Guéna LG has been doing several remixes for some great pop stars over the past 10 years (Gaga, Britney, Kylie, The Black Eyed Peas) and now decided to release his own material. This song in collaboration with american singer/songwriter Matthew Koma. The track is currently #32 in the French clubs, played on Top 40 format national radio Fun Radio, video played on NRJ 12, MCM and M6 Clubs in France. It was just released in Scandinavia on the Disco:Wax label and is at the same time supported by PR agency The Empire in Denmark. At this time, the track has been signed/licensed so far in Spain, Greece, Israel, Hungary, Belgium, Holland, Luxenbourg, and all Scandinavia, most of them starting now. Russia and CIE is starting to wake up. We are also starting working the clubs in the US with the Billboard Dance and Clubs Plays charts and already had the first feedback from radio DJs all over the USA, saying pretty awesome things about the song... We really believe in it, and hope for it to be the next big dance hit WW! Bryan is currently working on a song with his guitarist Kasper Falkenberg for a charity purpose called 'Flygtningestemmer' (Voices of refugees). Briefly, it is refugees writing lyrics and songs together with danish musician and Social worker Gert Barslund, and then danish singers and producers take the material and produce and record it. Other singers involved are i.e. Søs Fenger, Sys Bjerre, Julie Berthelsen, Tue West, Sara Grabow and more. The song Bryan is doing is called 'Waiting for love'. Copyright © 2014 BRec, All rights reserved.